Our primary goal at SKYe2 Farm is to develop a diverse and an experimental farm that follows organic permaculture practices. 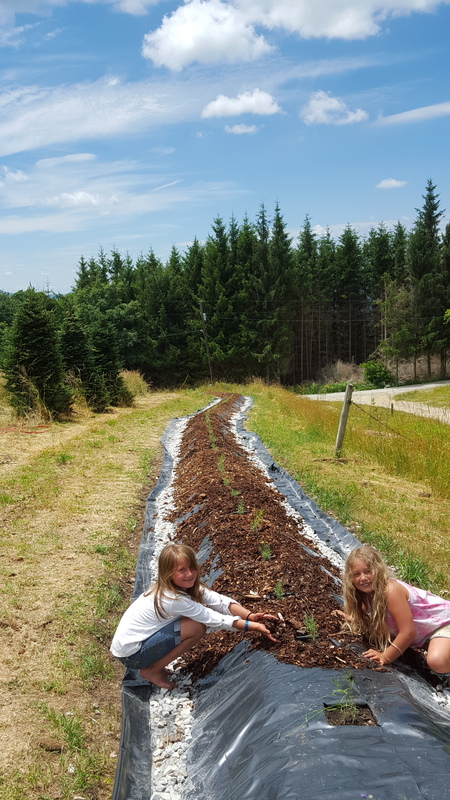 Located atop Old Beech Mountain in the high country of North Carolina, the property has been used as a Christmas tree farm although the majority of its Frasier firs will be harvested this fall. The site topography is fairly flat considering its 38 acre, high country location at elevations over 4000'. Beautiful, wild-flower covered meadows have long-range views in nearly every direction. Last year, dozens of new plants were added to the landscape and new plantings continue this season. Tree species include apple, pear, walnut, chestnut, cherry, pawpaw, pecan, almond and willow trees. Perennials include lavender, hops, raspberries, mushrooms, blueberries, horseradish, asparagus, forsythia and flowers of every variety. Annuals include flowers, garlic, vegetables, pumpkins and much more. As the best crop choices are evaluated after this season, the scaling of plant production will be our next initiative. This season three honeybee hives have been added to the landscape too. As this multi-faceted metamorphosis continues to evolve, join us for an awesome outdoor farm adventure. SKYe2 Farm is beautiful, diverse and is a memorable place to picnic, photograph, admire and enjoy throughout the seasons. Our Farms layout is best described as an open bald which is bordered by native forest. The property perimeter is approximately 1700' by 1000' in a rough rectangular shape. The altitude ranges from 4200' to 4400' and a small containment pond exists below a natural spring. Currently, the ratio of Frasier fir trees to open fields is roughly 35%. SKYe2 Farm is being developed by Charles King (uncle) and Charles King (nephew). Come visit and enjoy the day in the SKYe!